A cool way to map out and display an argument or discussion. The widget is generated from the aMap website, but is easily widgitized. 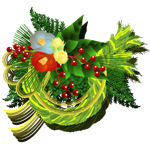 The site also offers some social functions and your widget can be commented on by viewers. Neat little widget. Watch the little train make it's way across your blog. Code is easy to spot on widget's web page. This is a widget for train lovers. Just watch the little guy speed along on your blog. Code is easy to spot on the widget's web page. This widget displays the 'Onigiri of the Day' from the Japanese website devoted to onigir (rice balls filled with different kinds of ingredients. Perhaps the most popular being salmon, pickled plum, and tuna fish). The widget describes what kind of Onigiri is displayed, the date, how many have been registered on the website and how many different kinds. The code is easy to spot at the bottom of the widget's webpage. Here's a cute Valentine's widget. 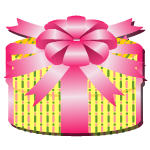 Click on the present box and a window appears with a heart shape, letters of the alphabet and a strawberry. Drag letters onto the heart shape like blackboard to create a message. To return to the original widget, click on the strawberry. For dog lovers and those learning Japanese. Images of different types of dogs are displayed along with the breed's name and explanation. The Japanese is geared towards children, so appropriate for beginning learners. The code is on the bottom of the widget's web page. For cat lovers and those learning Japanese. Images of different types of cats are displayed with name and explanation. Code is on the bottom of the widget's webpage. If you are into small, cute animals or are learning basic Japanese, this is a great widget for you. The language is aimed towards children, so appropriate for beginner learners. Code is on bottom of widget's webpage. Click on the Shimenawa, a traditional New Year symbol, and enter a Japanese style room where you can play the popular children's game, Ofukusan. Drag and drop pieces from the box below Ofukusan to create her face. Place your cursor on the bottom left symbol to see a completed example of the face. Click on the red cow to return to the Shimenawa. 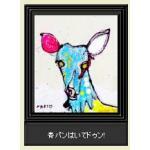 This widget displays art from the art gallery and sales website, Art-Gallery. The artwork changes with each refresh of the page. Choose from 6 frames. Code is impossible to miss under each frame.